Leading a group of stranded people through a tough place, like a desert. How is that possible? All 3 of these situations seem quite different. In a very general sense, all scenarios above involve carefully managing people in the best possible way, in the most 'strategic' way possible to get the best 'possible outcome'. Of course, what constitutes the best 'possible outcome' and the challenges involved differ in each scenario. In Scenario 1, the CEO has to ensure that his or her senior staff are working on projects that match their expertise and skills to maximise company profitability and efficiency. The right people need to be appointed to ensure the company is being steered in the correct direction, in line with the CEO's vision of the company. Do we want to compete based on quality? Are we going to be aggressive in the way we capture market share? Will we compromise in certain areas in order to be more time and cost-efficient in others? At the highest levels, people management is involved. For example, there is no point placing your most talented on a task they are no good at, completely at odds with their strengths or weaknesses; doing so would be commercial suicide. Every such mistake would cause the company as a whole to be at a disadvantage to a rival. As for Scenario 2, parents usually have short, medium and long-term visions of where their kids ought to be. Not all kids are the same; every child has different interests, passions, personalities, strengths and fears. Children develop at different rates and experience life differently. Some learn VERY differently too. Accordingly it would be wrong to think that all children should be raised in the same way. As parents you have milestones, or 'checkpoints' that you would be aiming for in each child's life..and how you get there for each of them is likely to be different! You may have a general overarching parenting philosophy that you apply to all of them..but you'd probably have different/specific parenting techniques for each of their circumstances. Scenario 3 is all about survival. Everyone would probably be allocated a task. There is someone to scout for water; someone to hunt for food; another leads or navigates; someone to fight predators; some probably have to do two or more things..or even everything. But the tasks are allocated based on the different skillsets of each person and perhaps the current situation/danger faced by the group. The group can only move forward if everyone is properly functioning, working together as a team and everyone is given a task they are capable of performing. You are only as strong as the weakest on your team. I suggest that managing a team during World Cup Qualification is no different. The campaign is spread over a few years. There is considerable planning involved. Personnel available to you changes, depending on injuries and who is in form or not. Every opponent is different, every away trip is a new challenge, and new strategies must be used in each game. The long term aim is qualification. There can be no other goal. The Socceroos are in a bit of a predicament now. They are very much in a transition phase. Our head coach, Ange Postecoglou, has on many many occasions emphasised, through words and actions, that he would like to transform Australia into a free-flowing attacking football side that likes to maintain possession and pass their way into goals. This worked well on our home turf at the Asian Cup 2015. However it seems like other teams have woken up to our tactics. Or maybe the tactic isn't working when we travel to faraway places like Iran. However, what has frustrated fans most is Postecoglou's refusal to change the style imposed on the team and to continue doing the same thing even when it isn't working -- and when he does not have the personnel to do so (our team has not improved much, many lack match practice - but perhaps it's more that the method has not been working recently). Others have expressed this better than I ever will - see for example comment by Ewen Page at this link (although I will quickly disclaim here that I don't agree with everything he says and the tone he uses, but I agree with the gist of it). On one hand, playing attractive football like the European or South American nations do is a nice romantic ideal to have. It's a good long-term aim. But if our personnel..currently lacks the skill and strengths to do so, it would be a disaster to try to mimic such a model of football. The main priority is Australia need to qualify for the next World Cup because that is what inspires the next generation. This means that when we travel away to countries where the pitch is muddy, or the going is tough, we can't always play 'pretty attractive football' - sometimes you have to scrap for results even if it doesn't look pretty. I am not sure Postecoglou appreciates this. He has repeated on several occasions that he insists on imposing the same brand of football regardless of who his opponents are. Ideals are nice, but every situation is different. Scrapping for a win is not disgraceful or undignified. It is all part of the strategy and, in many situations, it is completely warranted. And this is where I attempt to tenuously link all of this to the three scenarios I have described above. Like all the scenarios above, the leader of a team must adjust their strategy based on the strengths of those under their wings. You don't impose a strategy that is out of their reach or completely unsuitable to the conditions. It's horses for courses. I hope we can lift our game for the next 4 matches, because if we don't, we will not qualify for the next World Cup. The way we have played the last 4 matches certainly suggests that we are not up to standard. This next match against the UAE..is a must-win. 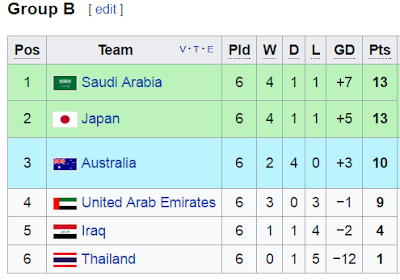 The last time this happened..was probably when Australia had to play Oman and Iraq during the 2014 qualifying campaign? That said, the team should take this as an opportunity to rise through adversity. After all, that is how real life is like and how we become stronger :) They need all our support and encouragement! !